Do you know how many teeth your dog has? 42. 42 chompers that help them eat, gnaw on bones, your shoes, your hands and whatever else they find appealing. The question is, how are you going to help make sure they keep those chompers healthy? Growing up, I hated the dentist. It still isn’t my favorite place to go, but I have a wonderful dentist which makes it easier. Still, I don’t floss as much as I should (or ever). I generally don’t like teeth. That sounds weird, but now that my nephew is in the “loosing teeth” stage, every loose tooth he points out to me makes me shudder with fear as he bends it forward and back. Gross. By telling you this, you would think that I would steer clear of Tucker’s teeth. You forget that I am the crazy dog mom—and I have been on the receiving end of his puppy teething escapades and still get chomped on every once in awhile during an intense game of tug. So, I’m all about keeping his teeth healthy. 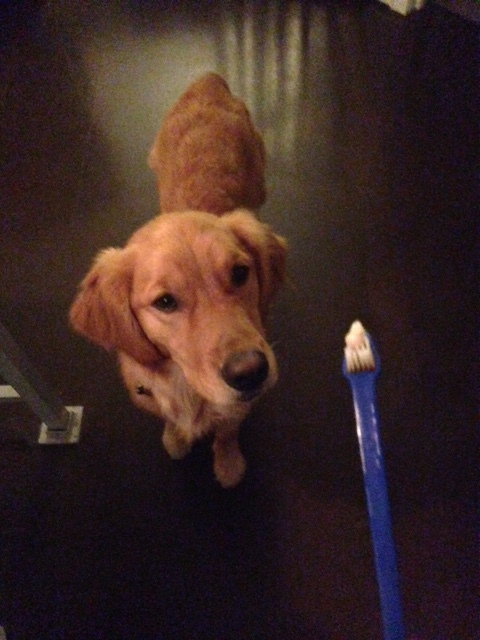 Tucker gets his teeth brushed about 2-3 times a week by me. Seriously. Our vet told me last year that the only dog teeth he’s seen that were whiter than Tucker’s was the beagle of a dental hygienist. I gave myself a high five for that one. It’s pretty easy to keep your dog’s teeth and gums clean too. You can get a toothbrush and toothpaste from your local pet store or pet product site online (DO NOT USE YOUR OWN TOOTHPASTE ON YOUR DOG!). Tucker is partial to the poultry flavored kind. I’ve never had an issue with getting a toothbrush into his mouth, but I use my hands to help me brush his teeth with the the toothbrush. Do we get every tooth, every time? Probably not, but we get the main ones. And no joke, I usually do it before bed and after he’s done I say to him, ok, now rinse and go to bed…and he drinks water and hops into the bed some nights! (genius dog). If you don’t want to brush your dog’s teeth, there are other ways you can go- there are dental chews and bones that promote good breath and clean teeth. I haven’t tried those yet, but others have had success. You can also get your dog’s teeth professionally cleaned. Another note I want to make, the one thing I am terrified of regarding Tucker’s teeth is him possibly fracturing a tooth on a bone. So always be careful with what you give your dog and watch them as they chew. As a friendly reminder, I am not a vet or a canine dentist. For more information on this topic, I’d recommend you visit the American Veterinary Dental College, American Animal Hospital Association, or the American Veterinary Medical Association.